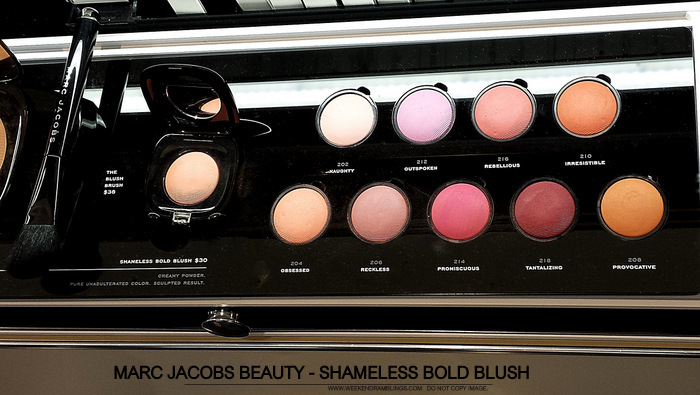 Marc Jacobs Beauty - Shameless Bold Blushes are inspired by the designer's tattoos and give you "the permission to pursue all the wrongs that feel so right." The sleek packaging theme continues with these blushes which are housed in a shiny stylish square compact that with a protective silk pouch. 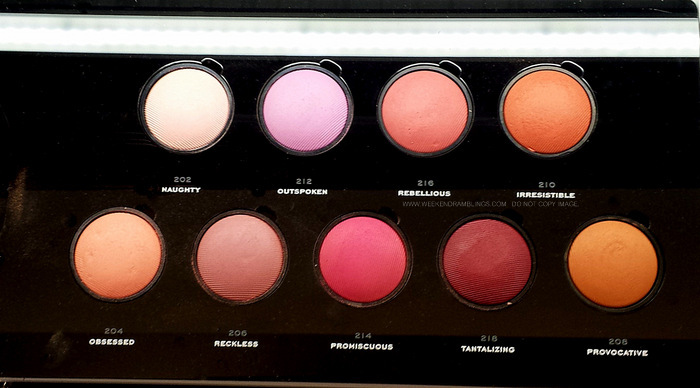 Also included are a portable blush brush, dot mirror, and an exaggerated button for easy compact closure. The formula claims to be infused with bio-lipids and essential amino acids, and the ultra lightweight blushes promise silky smooth application and bold vibrant color. Scroll on for more photos and swatches. 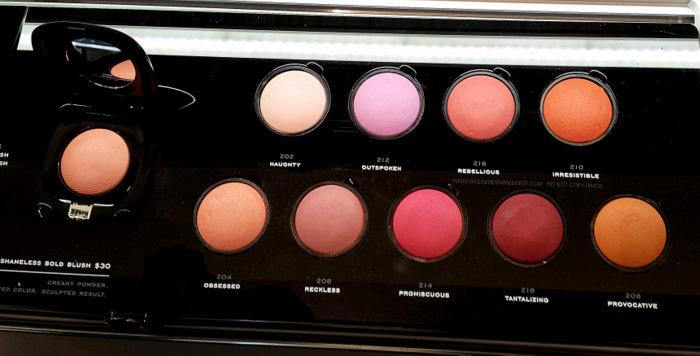 With a name like "Shameless Bold," I was expecting the Marc Jacobs blushes to be popping, vibrant, intensely pigmented shades. They sure look like that in their cute round pans, but perhaps because these were testers left out in the open and swatched by a whole lot of people before me, I found them a bit lackluster. The colors that look scary pigmented in the pans turned out suprisingly toned down on my hands (my swatches are quite heavily applied). I used a disposable eyshadow applicator to pick up and apply the swatches, and I am sure the application would be quite different with a brush, specially the natural-bristles Marc Jacobs angled blush brush. The softer application might be a good thing too, especially if you are looking for layering on the colors and getting a more controlled application. I can definitely not rate a product based on a couple of swatches, and the early reviews on Sephora mention smooth, natural application and pretty good results with the blush. Product information and shade details from the Sephora website. Link provided for information only and is NOT an affiliate link.